On Sunday 28 October, Feyenoord will visit arch-rival Ajax. This football match has been known for decades as the Ultimate match of the Netherlands, capital U. It was only a matter of time before a chess set representing this Ultimate match was created. The Feyenoord-Ajax chess game at the Chessmen Museum is a recent acquisition. It is part of the Rademaker Collection and has been on display in the museum since the end of last year. We don´t know when the game was made, but one thing we can say for sure, is that the players’ uniforms date back to before 1982. From that year on, advertising on shirts was allowed and the sponsors´ names were printed on the shirts. We have been kicking balls around for centuries, but as a national sport, football did not start to develop until the end of the nineteenth century. Before that, sports were only for people from the upper class. Working days were a lot longer and wages were low so most people simply did not have enough time and money to practice sports. The two clubs of this chess set have existed since football is a national sport. Ajax was founded in 1900 and Feyenoord in 1908, in a pub in the Feyenoord district in Rotterdam. In the early years, people played football on a square called Afrikaanderplein. The people who lived in the working-class neighbourhoods in the south of Rotterdam were poor labourers and it was difficult to provide the club with the necessary equipment. The footballers could not pay for a leather ball, for example, and so they made one themselves, out of old newspapers with some rope tied around it. Ever since the beginning, Ajax was the wealthier and therefore more professional club. The club from the east of the city of Amsterdam had many members from the middle class who could afford to pay a higher membership-fee. Ajax did well in the early years of the competition, which consisted of amateur players until 1954, and it won the league title in 1918 and 1919. The popularity of the club rose and the wooden stands in the east of town were no longer sufficient. A larger stadium was needed to accommodate all the supporters and spectators and, in 1934, stadium De Meer opened its doors in the neighbourhood of Watergraafsmeer. Feyenoord was promoted to the Dutch league in 1921, and in 1924 the club became national champion for the first time. Feyenoord´s audience also increased and the stadium steadily got more crowded. In Rotterdam, however, they had to wait a bit longer until the dream of a bigger stadium came true. Feyenoord team captain and player of the Dutch national team Puck van Heel drove the first pile of the De Kuip stadium in 1935. The new stadium had room for 60,000 spectators. In their early years, both clubs met with their biggest rival in their home town. For the popular football club DWS, a match against the more elite Ajax was of great importance. The same went for Feyenoord, the people´s club from the south of Rotterdam, when they played against Sparta, the elite club from the west of town. For a long time, Sparta was the better club and they won the league title five times in those days. But Feyenoord became more and more professional and in the year that the club promoted to the main league, Sparta was relegated. The matches between fellow-townsmen were the most popular ones for a long time. Both the players and the supporters were just that bit more fanatical and defeat was felt even more deeply than usual. But already in the first match between Feyenoord and Ajax, in 1921, the tension between these two teams could be felt. Ajax player Theo Brokmann shot a ball that hit the crossbar: all Feyenoord players and supporters saw the ball land in front of the goal line, while all Ajax players and supporters of course saw it land behind the goal line. The referee decided in favour of Ajax, but after a protest was filed by Feyenoord, the decision was reversed by the investigative committee a few weeks later. New final score: 2-2. The media have described the matches between Feyenoord and Ajax, but also the city derbies, as the ultimate matches since the beginning of professional football. But the Ultimate match, with a capital U, was coined only in the eighties. Since then, the Ultimate Dutch match has been the one between Feyenoord and Ajax. In those years, the differences between the clubs were also increasingly highlighted: the workers’ club against the arrogant show-offs. With players who are known for their enthusiasm when it comes to taking on the technically gifted showpieces. The supporters treat their players much in the same way: hard worker Dirk Kuyt has always been held in high esteem, while brilliant footballer Van Persie was loathed in his younger years because of his swagger. Whereas in other countries the ultimate matches are played between clubs of different religions or two clubs from the same city, our Ultimate match has an economic background, with the corresponding cultural differences. The differences between most Ajax and Feyenoord fans are not that big anymore now though, and supporters of both clubs can be found all over the country. But even if the clichés are no longer applicable these days, they continue to give the Ultimate match a sensational character. Have fun watching the Ultimate match on October 28th. 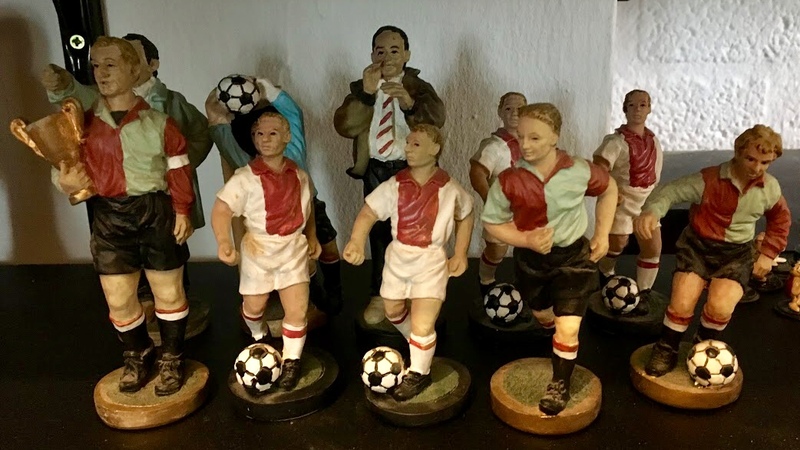 Those who want to hang on to the arch-rival feeling for a while longer can indulge in the Feyenoord-Ajax set at the Chessmen Museum.